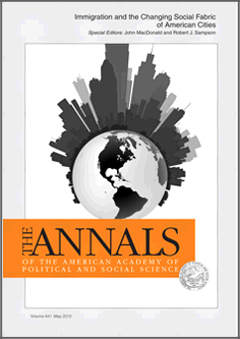 The Annals of the American Academy of Political and Social Science publish six issues per year on selected themes. Many of you might be aware of the November 2008 issue on exceptional outcomes for immigrant youth. This past May, they had another immigrant-themed issue, on how immigrant communities are changing American cities. Several articles look at changing enforcement of immigration law and its effects on communities. Another article looks at crime and enforcement in New York City, and others look at new destinations. For those who study immigrant youth, an article explores why immigrant youth are less violent and crime-involved than similar nonimmigrant youth, a thematic addendum to Kasinitz, Mollenkopf, Waters, and Holdaway's book Inheriting the City.